Hey there, it's Gwendolyn Berry!! Please help me to be the first U.S. hammer thrower to medal at a World Championships!! Follow my journey on the way to the podium! Hey Guys!! Check out all the offerings I have available!! Let me Thank you for your support and believing in my dream and journey!! 50% of funds received will go to St. Jude's Hospital. 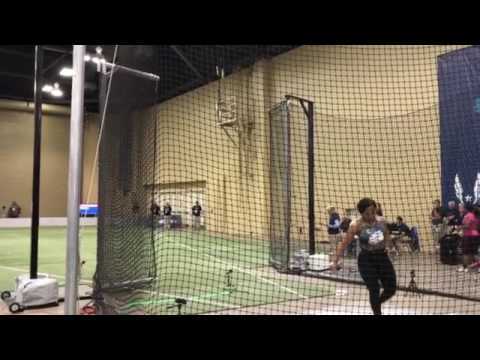 Hammer Throw American Record - 77.78m / 255'-2"
Born and raised in the greater St. Louis area, Gwen attended McCluer High School in Ferguson, MO prior to Southern Illinois University, where she earned a degree in Psychology and a minor in Criminal Justice. First recruited to be a triple jumper for SIU, when she finally decided to try the hammer, Gwen threw the Junior National Qualifying mark in her first three months of training for the event. A multiple time All-American for the Salukis, Gwen has also enjoyed success in the hammer since graduating, having recently been selected to represent the USA in the Pan-Am Mexico Festival, and earned a spot on Team USA at the Rio Olympics. This was an special event for her in more ways than one, as she had the opportunity to compete against a woman that she has idolized since the first time she picked up a hammer, Yipsi Moreno. As Gwen says, "Yipsi Moreno, in my opinion, is the most decorated female hammer thrower in history based on her longevity and persistence in this event." Gwen has set a high bar for herself, aiming to become one of the first Female hammer throwers from the USA to win an Olympic and World Championship medal; which she recognizes will be hard as an American thrower due to the deep pool of talented throwers that respectfully represent the United States. Gwen is not your average looking hammer thrower, as her presence makes her unique in the event. She states, "Most people still believe I run, even though I know I am too big to run." Her detemination to make a name for herself is evident by the volumous heart and spirit she brings to every competition. Outside of the ring, Gwen is an extremely humbled individual. She works three jobs to stay in the sport and fund international travel, and holds a strong dedication to her family and the collegiate athletes she coaches.